Otto Piene, “Lichtballete” (Light Ballets), 1963–2013, mixed media, dimensions variable. Tracing Otto Piene’s rhythmic oeuvre, this poetically curated survey draws the viewer upward, elevating us from the earthly to the celestial, body to soul. Smoldering red paintings alive with molten hues flaring against tar-black clouds fill the first room: soot left by solvent set alight. The elemental love of color evident in these blazing crimson canvases distinguishes Piene from the other members of ZERO, the avant-garde group he cofounded in Düsseldorf in 1957. But like his peers, Piene famously pursued means of nontraditional mark-making, from using fire (in the tradition of his mentor Yves Klein) to pressing oil paint through screens onto canvas. A selection of “Rasterbilder” (Screen Pictures), also on the ground floor, are seductively tactile. Rows of white puckered bumps stud the mustard ground of Untitled, 1957/1967, like an army of barnacles. Piene’s ethereal “Lichtballete” (Light Ballets) send dazzling patterns soaring across the third floor’s walls and ceiling. Golden anemones trail corrugated tendrils around the darkened room, lazily drifting through shifting planes of rosy bubbles and stars that morph into prismatic chrysanthemums. 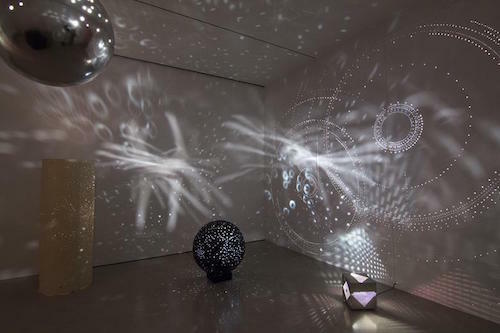 These projections, cast by kinetic lights whirring inside several perforated sculptures (hollow spheres and boxes comprising repurposed “Rasterbilder” screens), are at once hypnotic and stimulating. Created between 1963 and 2013, they testify to Piene’s tendency to revisit different chapters of his practice. These works will be familiar to those who saw the recent ZERO exhibition at the Guggenheim, but they assume new transcendent heights here as a coda to Piene’s mercurial career.